These Rigid Plastic Horizontal 2-Card Dispensers have frosty finish with UV protection and feature two slide ejectors for easy card removal. They're slotted on the back for easy attachment to lanyard, badge reel or chain. 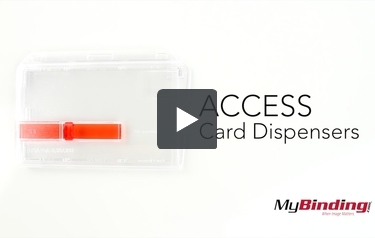 Get 50pk on every order of Rigid Plastic Horizontal 2-Card Dispensers with Slide Ejectors. These rugged dispensers feature two slide ejectors for easy card removal. Slotted on the back for easy attachment to lanyard, badge reel or chain.